This study aims to increase international attention on the gender equality dimensions of energy access in the run-up to Rio+20 and contribute to the Sustainable Energy for All (SE4ALL) initiative and its goal of ensuring universal access to modern energy services by 2030. The objective of this briefing note is to provide World Bank energy task teams a brief overview of the key issues, resources and tools to help integrate gender consid- erations into energy sector operations. 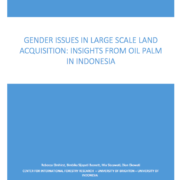 This publication is a desk review of gender-focused approaches in the renewable energy sector. This manual is designed to help planners and decision makers identify, understand, predict and respond to gender differences, opportunities and needs.